Launched in October by the people behind popular playing destinations CasinoLuck and NextCasino, Wild Slots was released with one ambition in mind, to offer a place for slot lovers to just play slots without having to navigate around various other casino game types. Slot games are undoubtedly the most popular aspect of online casinos these days, and to that end the logic of Wild Slots is difficult to argue with. However, looking at it from the other side, how difficult is it to find slots on a site that also has a few table games and scratch cards thrown in? It’s tough to know whether Wild Slots is filling a necessary gap in the iGaming market, or fixing a problem that nobody suffers from. When it comes to such questions, it tends to be within the content of the site that a decision is made, Wild Slots could go either way, and how the concept is executed is clearly going to be the difference maker. When you look at the success of its casino brethren, Wild Slots clearly has the right people behind it, but is that enough? Or is Wild Slots just answering a question that nobody has asked? With a name like Wild Slots, there’s a certain level of expectation for the design of the site to be loud and fun, and that’s just what you get here. Making the sensible choice of having black be the primary colour within the design of the site means the bright orange colours in the logo and other parts of the site isn’t too much, and instead creates a pleasing contrast. The rolling banner across the top of the homepage incorporates bold colours and many images of fire, which creates the ‘wild’ effect comfortably well enough. It’s always nice when the style of a site matches its name, and that’s something that Wild Slots has absolutely nailed. The main background once you scan down the site is white, which works against the theme a little, there’s no reason for this not to be black and this small change could make a huge difference. The thumbnails of popular games that have become essential for new sites are here and work well within the theme, again, they would work better on a black background on this occasion on though. Wild Slots is a new site, but a new site that clearly intended to kick the door down on entrance to the online casino market. 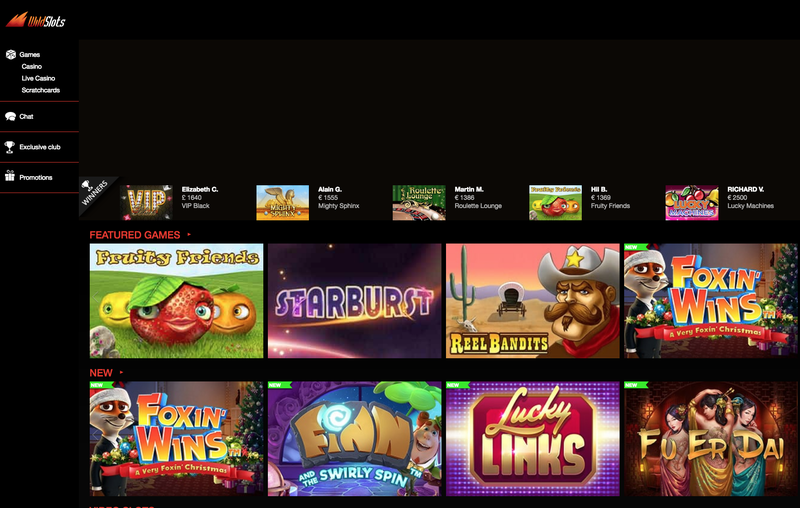 Instead of being content to start with one or two software providers and then work from there, Wild Slots on launch had a collection of games from the likes of BetSoft, IGT Interactive, Microgaming, NetEnt, NYX Gaming, Play'n GO, and Quickspin. There’s still space for a few more names here, but there is no questioning that this is a very good start. When you are only offering one game type, as Wild Slots is with slots, you need to make sure that you have everything that falls into that category, and with hundreds of video slots, as well as classic and jackpot slots, Wild Slots are ensuring that all types of players that favour spins over all other game types have a good amount of choice here. Whether being slots exclusive was the way to go remains to be seen, there are other sites that offer a similar number of slots alongside table games for example, but if you are bored of navigating through a host of other game types to find your favourite, then Wild Slots may well be what you have been waiting for!